As much as we would all like to be at every event, sometimes it isn’t possible. When flight ticket prices soar, schedules are crazy and an event falls on a weeknight… staying home to watch a big show may be the only option. Just because you aren’t there in person doesn’t mean you have to make it any less of an occasion. If you haven’t scored great seats, then why not treat your friends to the ultimate viewing party…in the comfort of your living room? I’ve always liked Oscar viewing parties, where the host sets the stage to reflect Hollywood glamour. Everyone talks about the clothes and dishes on what the winning films will be. I just love the idea of that same spirit applying to one of Nashville's big nights! For the first time EVER, the Grammy Nomination telecast was held in Nashville, and it's our time to shine and celebrate on the big night as well. So many of Music City's artists are up for awards and dozens more are attending. It's definitely a telecast not to miss. - Create a playlist of songs from nominated acts. It will get you into the spirit of throwing a party and rooting for your favorites. Select the songs nominated (male/female artists, album, newcomer, ect). Compile and burn all onto a CD. Put into creative covers and send out as your invite asap. Hand delivering is a nice touch. (This is also your party favor) Play the same mix in the background as guests arrive pre-show and while watching the red carpet coverage. -Your primary mission is to engage your guests. Get them to ‘vote’ for their picks on who nominees will be on ballots pre-show, and provide prizes for the 'lucky' guessers. Something reflecting the occasion is ideal—like a bottle of Tennessee whiskey.. Jack Daniels' single barrel is an ideal choice. The items you choose really depend on the crowd you’ve invited. 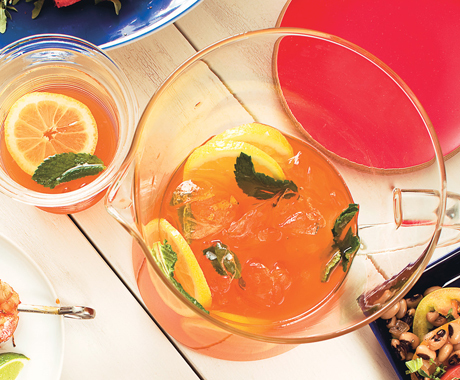 Mix all in a big pitcher and serve over ice. Squeeze a bit of lemon in each glass prior to pouring. As for the menu, choose favorite foods from nominated artists or just create a southern buffet (much easier). You can never go wrong with picking up pre-made items from Martha Stamps or Loveless Cafe and creatively placing them in your own serving pieces. Get out your platters and stack them high with fab local fare. I also embrace the idea of keeping it beautifully simple by serving various crackers, meats and cheeses on wooden boards. Easy appetizers for watching the show. 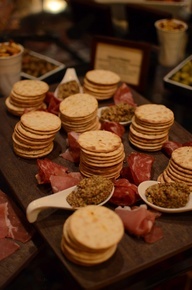 Crackers, mustards and Italian cold cuts! Please do share your details for your own Grammy Awards party here on the Southern Sophisticate!